Municipal governments in the United States are submitting proposals offering billions of dollars of incentives to bring Amazon’s headquarters to their city, but the E.U. is less enthusiastic about “GAFA” companies. According to EU Observer, finance ministers from France, Germany, Italy, and Spain are preparing to advocate for increased taxes on Google, Amazon, Facebook, and Apple. The point of dispute between some European Union member countries and GAFA companies is about the area in which those companies pay taxes. Currently, companies like Apple pay taxes based on the location of their subsidiaries in Europe, not based on where they make profits. Companies have been able to pay lower taxes by locating their subsidiaries in lower-tax countries like Ireland. The finance ministers and governments of France, Germany, Italy, and Spain (among others) are petitioning to change the regulations of the E.U. to require companies to pay taxes based on where their profits are generated. Meanwhile, companies like the France-based Dassault Systems (who recently purchased a systems engineering company) seem to be focusing their strategy on finding ways to provide unique added value to their clients. Across Western Europe, ICT companies are innovating their offering in an effort to stay on the cutting-edge of their field and compete with the U.S. and Asia. I visited the Fortune 500 list of the world’s largest companies and their country of origin and found that few of the largest ICT companies are based in Western Europe. Companies from France, Portugal, the U.K., and other Western European companies may need to think out of the box (whether through acquisitions, unique offerings, new technology or competitive pricing) to stay competitive in the global ICT market. “Internet of Things” Companies Face Competition from Asia and the U.S.
European companies, particularly manufacturers of IoT equipment, have struggled to compete with the massive players in the U.S. and parts of Asia. Companies like Amazon and Google are pursuing ambitious innovation in the Internet of Things space, while more traditional industry companies like Cisco, Dell, and GE are producing “smart” devices and services adjacent to IoT. In Asia, Hitachi Data Systems (Japan) and Huawei (China) are investing in developing IoT applications and platforms. Huawei has recently been expanding in Spain, with a focus on smartphone sales and eventually, brick and mortar stores in Madrid (South China Morning Post). I identified an exhaustive report conducted by Industriall European Trade Union – a federation with 7 million members that represents over 200 unions. Industriall’s 2016 report on anticipated changes in the ICT market in Europe reinforces what we’ve seen working with companies like M2M from Hungary and ITI Communication in France. That is, companies in the smart grids, medical electronics, and industrial automation industries are growing in number of employees more than companies in “pure electronics”. The trends in the ICT segments of Western Europe generally follow the trends in the rest of the world, with growth in innovative technology areas such as Smart Cities and Internet of Things devices, industrial automation, high-tech visualization systems, and software development. In contrast, Industriall anticipates a continuing decrease in employment in the consumer electronics and domestic appliances industry, among other long-established industries in Europe. 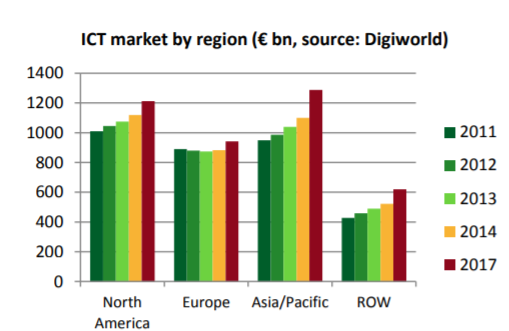 Despite the fact that many segments of the ICT industry are growing in Europe, Western European companies across the ICT sector are finding it difficult to compete post-recession with U.S. and Asia. Another country in which ICT is a hot industry is Israel – but that’s a topic for the next blog post! Noah is the Marketing Associate for FB International LLC. Noah focuses on supporting the marketing, social media, and business development efforts of FB International’s clients.